shops. 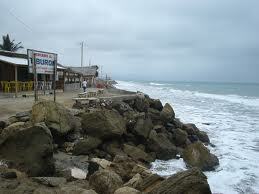 You are just 20 minutes away from the city of Bahia and 40 minutes away from Manta. Manta has an airport with several daily flights to Quito and Guayaquil, good medical clinics, a new shopping center as well as good hotels and restaurants. during the nights. San Clemente is surrounded by farmland with tropical crops. ancient cultures and there are several archeological sites close to the development. San Clemente is the perfect place to enjoy long walks on the beach and a tranquil lifestyle.